Lake Recap: Fishing. Lounging. Relaxing. Last week husband and I joined his family at Claytor Lake for vacation. Living in two cabins for the duration, fishing off of our joint dock, meeting for outdoor dinners at the picnic table, lounging by the water on the 'beach', and playing games was the entirety of our time. We didn't have agendas or to-do's. It was strictly a relaxed seven days spent doing whatever we pleased. And it was just what we needed to end our summer. There was also a lot of almost-fall going on too. The dogwoods had started to turn into a beautiful red, and the temperatures stayed relatively low if not chilly. Fishing from the dock turned into a daily thing for us. We'd start early in the morning, break for other activities, and retreat back to the dock for some evening fishing after dinner. 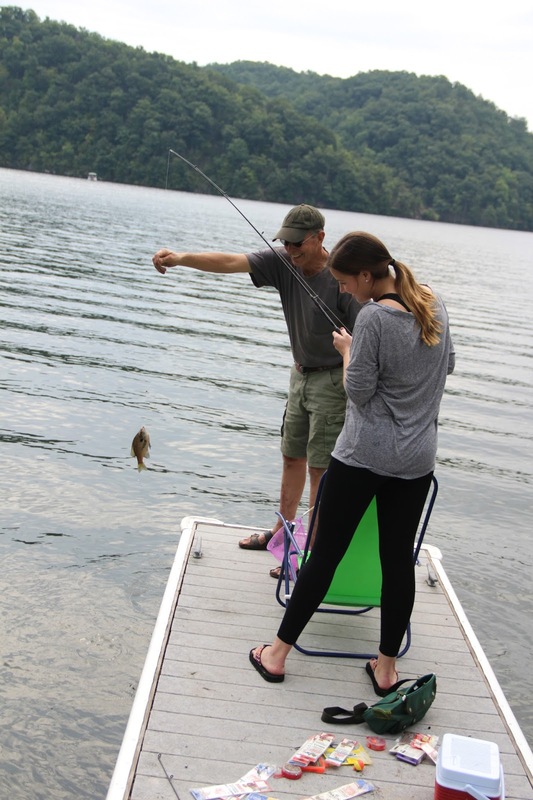 We had some so much fun catching the sunfish, unhooking them, and letting them go. Our nieces had the best time helping release them with their nets. We caught about 10 fish, all beautifully colored. I haven't been fishing since I was a kid. The excitement of feeling the tug on your line and reeling the fish in was still there as an adult. How can you not enjoy fishing?! My dad lent us his fishing poles and fishing bag full of everything we needed. I loved digging through the bag to discover what he had collected throughout the years. I especially loved how old some of those things were. This niece of ours was our fishing buddy for the week. She joined us every time at the dock and helped us release our little catches. Like I said, fishing is just as magical for an adult as a child, but it's still really neat to watch that excitement play out on a little one's face. I went into this vacation needing to relax. The "beach" section of the lake was my calm spot. I sat in a chair next to husband, feet in the lake, and book in hand. It was the best. My new tan thinks so too! I'm telling you, it truly felt like autumn was upon us at the lake. The tree by the dock was just dumping leaves, sending them spiraling down around us and leaving yellow-streaked, green leaves all over the ground, water, and dock. It was heavenly. Some nights we fished until it was almost dark. Little girls in pjs would keep us company and 'fish' with their makeshift fishing pole made of a stick, rope, and plastic dinosaur. Pretty inventive, right? They might not have caught any fish that way, but their imaginations about it all was great. Talk about peaceful evenings. The dock was the spot. I am more convinced than ever that I need to live right by the lake eventually. Lake Tahoe has been in my head lately....maybe there?? To see more photos, check out my Instagram. And next week I'll be sharing our time on the water!